I think you would agree with me that chicken thighs or drumsticks or chicken in general is something that most children like. 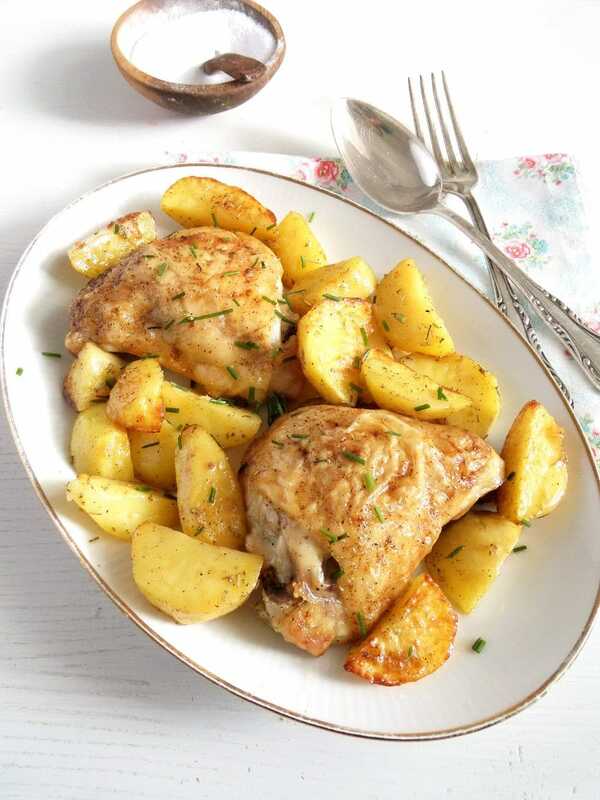 Soft, tender meat, not much fat, crispy skin when everything goes well, some potatoes and veggies on the side and my children couldn’t be happier. Me too, actually, I love chicken as well (probably the main reason why I could never go vegetarian, although we don’t eat a lot of meat generally). And it is pretty much the same with my own kids. Thank God, they don’t have to let themselves in and spend the whole day home alone, but they love eating chicken for lunch just as much as I did long time ago. The only difference now is that I’d rather bake the chicken thighs instead of frying them. I need less oil for baking and the mess is less. This is my basic way of baking chicken thighs, very simple and quick and totally fool-proof. I only mention salt, pepper and some paprika but you can spice your thighs the way you like. I sometimes use dry herbs or different sorts of curry, sometimes I use smoked paprika or cumin or coriander. Experiment and you will find your favorite seasoning soon enough. The resulting thighs are absolutely delicious, you will love every bite of them. Serve them with roasted potatoes and any kind of vegetables or salad you like. I love to make a nice tomato salad with lots of onions and parsley/basil in it. Preheat the oven to 200 degrees Celsius/ 400 degrees Fahrenheit. Line a baking tray with baking paper or aluminum foil. Place the chicken thighs in a large bowl, pour the oil over them and massage the chicken with your hands until everything is coated in oil. Place the chicken on the baking tray skin-side down at first. Generously sprinkle the underside with salt, pepper and paprika (or use other spices to your liking). Turn the chicken pieces skin-side up and generously sprinkle the skin with the spices as well. Bake for 40 minutes to one hour or until the juices run clear and the skin is golden brown and crispy. Serve with roasted potatoes and tomato salad. Completely agree that chicken thighs are kids favorite. Indeed these look so luscious, tender and delicious. Love how simple and quick these are! You’ve got me wanting to run out to the store and pick up chicken thighs! They look wonderful and I love the simple preparation! 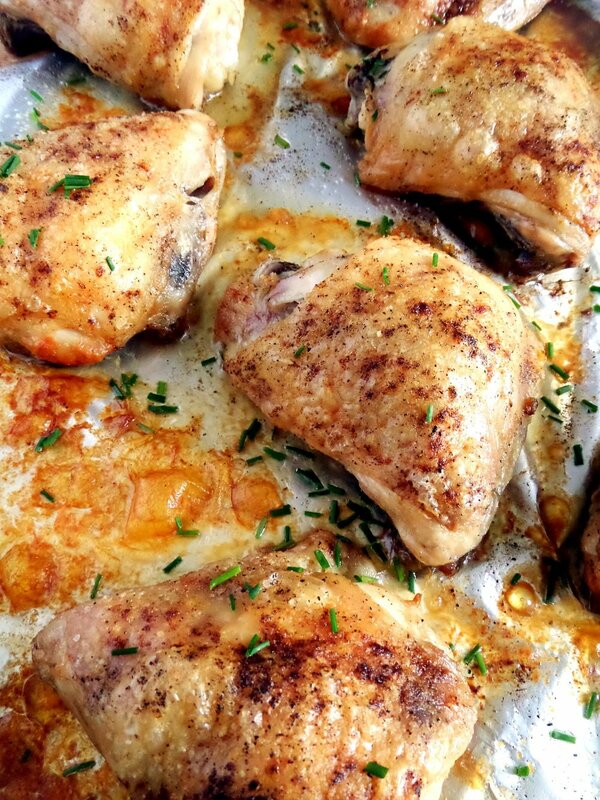 Baked chicken thighs are delish! I was a weirdo child who didn’t like dark meat, so clearly your children are much cooler than I was at their age! 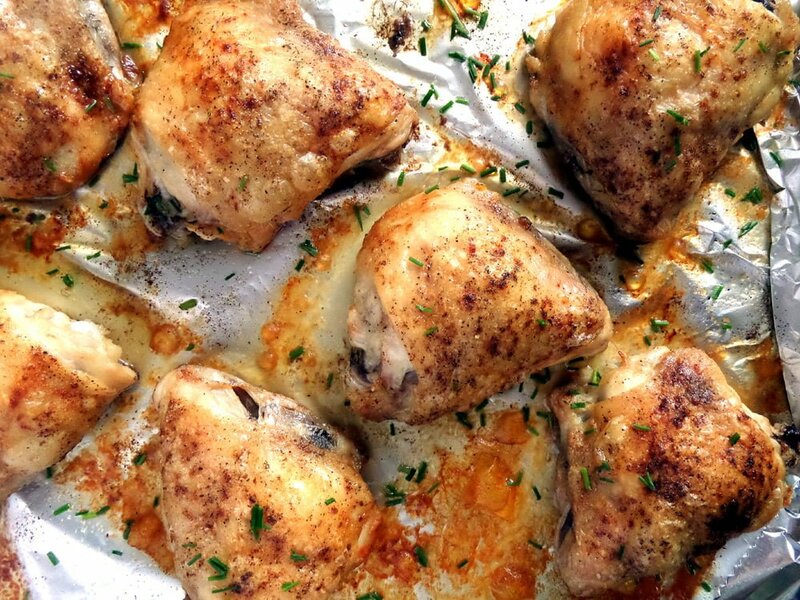 Loving this basic baked chicken! Perfect for any occasion! Cheers, my dear and thanks for sharing the yum! Mmmm. I can smell them baking in the oven right now! I always wanted a thigh when I was a kid, I detested drum sticks. What nice pictures. Thanks for sharing. They look really juicy and tender! I love easy delicious recipes like this, Adina. This looks so good! I love the simplicity of this chicken. 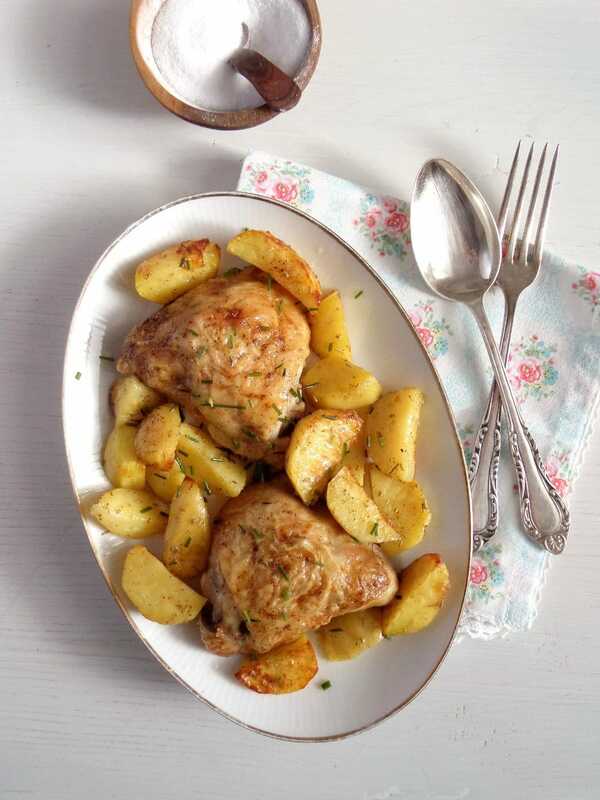 Simply prepared chicken is such a delicious, and comforting meal. Adina, you’re an excallent cook, and this recipe is once again great! The soup tasted my family very, very good and I’m happy, because it’s so easy to cook!! My kids (5+8 years old) also love baked chicken very, very much. They would like to eat it every day. Thanks your basic recipe, Adina, the preparation of chicken is very easy.